Here I detail the process of how I can work with you to create a fully functioning useful database system for your business. I would be pleased to offer an initial chat with you to determine if Access is the right product to fulfil your requirements, discuss problems you are having with current systems, and suggest solutions. Determining the most efficient way of storing your data always considering how you want to present your data (for example what information you require on reports) It is very important to ensure that data that is required in your outputs is actually stored. Discussing the types of data you need to store, how much space to allocate to each data item, for example you may want to store e-mail addresses, its important to set aside enough space to store a long e-mail address without allowing too much space which is inefficient. Determining unique identifiers in your data, for example Invoice numbers, Order Number, Part Number, Customer numbers. What is meant by Data Validation? This can take many forms, some simple and others much more complex, for example, the storing of your employees mobile telephone numbers (assuming an employees database is being constructed) would not be mandatory as not all employees would necessarily have a mobile telephone, or may not be happy supplying that information to their employer. Whereas, you would be likely to make the storing of 'next of kin' to be mandatory so that you would now who to contact in the case of an emergency. Another example may be that you were recording some measurements in a production environment and you knew that a particular measurement being entered would always be in the range 3-8 the system could ensure that users could not enter values out of range. This is also important when extracting data from your Access Database system, as it allows us to make assumptions that we know will be true, as an example if we were reporting on those measurements recorded above we would know they could only be between 3-8 as we had validated that during data entry. I normally develop Access Database systems that only allow users access to the system by entering a username and password, this does not always apply in very small businesses. In larger organisations this can be implemented in such a way that different people within your organisation can be authorised to undertake different tasks in the database, for example, only accounts staff may be able to view and edit financial data, whereas some managers may be able to view and report on some financial data but not edit it in any way. This can take many forms, if you are a small organisation I can advise on and setup data backup methods that would allow backup to external disk drives, other PCs on your network or online backup. It makes sense to backup your data regularly, and it is always better to store these backups remotely from your main office, therefore it is advisable to backup to removable storage media such as an external disk drive, or directly to the internet. For the larger company I would expect you to have a backup strategy in place, and I could advise who ever looks after your current backups on how to ensure your database is backed up as well. 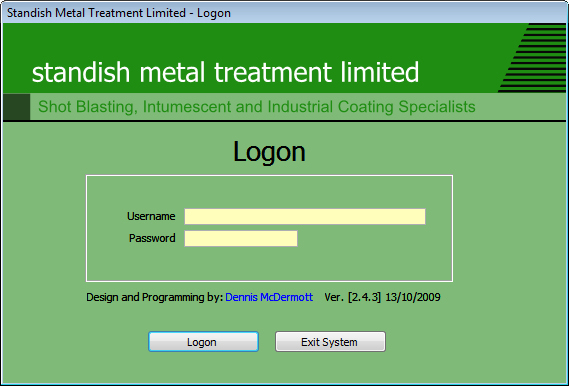 I always design my Access Database Systems as bespoke systems; they only display items that are used in the system, rather that displaying the whole of the Access user interface. This helps ensure that my systems are easy to use without all the confusing clutter of 'raw' Access. This also ensures that users do not inadvertently wander off into areas of Access where they have little or no experience, by using this approach my systems are far more robust that those which do not provide this level of configuration. 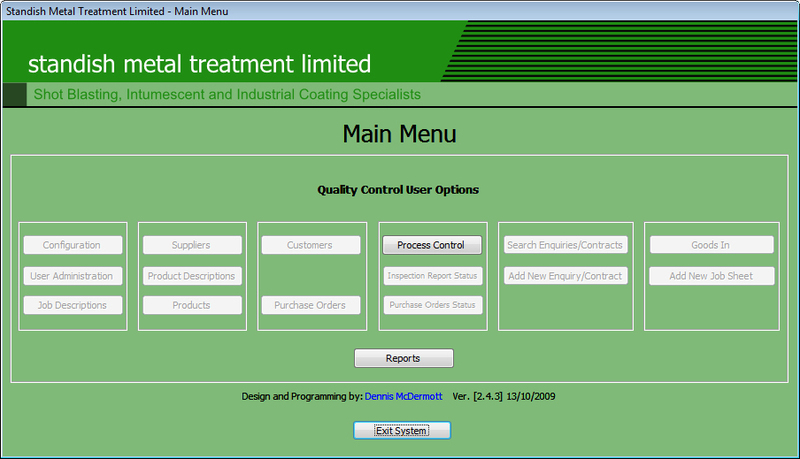 I always supply my systems in a form where the end users cannot make changes to the design or programming code. I will supply your system as compiled mde files which operate faster that un-compiled mdb files and are not changeable by the end user, thereby increasing the robustness and security of your database system. Whereas, the overall administration user would have access to all the tasks including the setting up of other users, and the Administrator would be trained by me to be fully conversant with the operation of the entire system. This enables the user access to many areas of the system where they could cause damage, probably unintentionally. I supply databases with a customised menu system that only offers the facilities that are required, and is semi-intelligent to only offer facilities relevant to the current task. Here you can see there are less options, and some are disabled (shown as grey) as they are not appropriate to the current task. A system can have many forms; these are where you enter data into your system and are also used to interrogate your database to find information. Speed of data entry can be greatly improved by a combination of programming and data structure. For example if you had a system that needed to record information about flights, I would present a box that the user could select a country from, titled Country; this would contain a list of countries sorted alphabetically, when the user selected a country (this is far superior to letting a user type a country as they may misspell it and that would have a detrimental effect on your data integrity), lets say they select 'United Kingdom' then I would program the system so that the next box titled 'Airport' would only contain a list of airports in the United Kingdom, thereby guiding the user rather than letting them enter data that could be inconsistent such as entering USA as the country and London Heathrow as the airport. At various stages of operation it is useful to ask users to respond to questions or simply tell the user what is happening. Here you can see the title says 'Customer Deletion' so the user knows what the message is about, the message box shows a red X so that the user knows this is an important question, the message itself is clear about what will happen if the user clicks 'Yes' The default button has been set to 'No' so if the user accidentally presses the enter key the deletion will not take place. 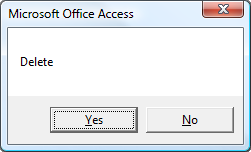 This simply says 'Microsoft Office Access' in the title, there is no red X, the message simply says 'delete' and the default button has been left as 'Yes' so if the user accidentally pressed the enter key this customer data would be deleted. The creation of systems that provide the first type of message to the user rather than the second type comes from experience and many other developers may not have the required level of experience to design a really user friendly interface. As well as programming in the functionality described above I also create feedback messages that speak the users language, not a database developers language, so no words like Record, Database, Index, but words appropriate to your business, for example, Invoice, Customer Order, Client Request. A report is where you produce outputs from your Access Database system. Normally clients have requirements for at least a few basic reports, whereas some clients require very complex reports. 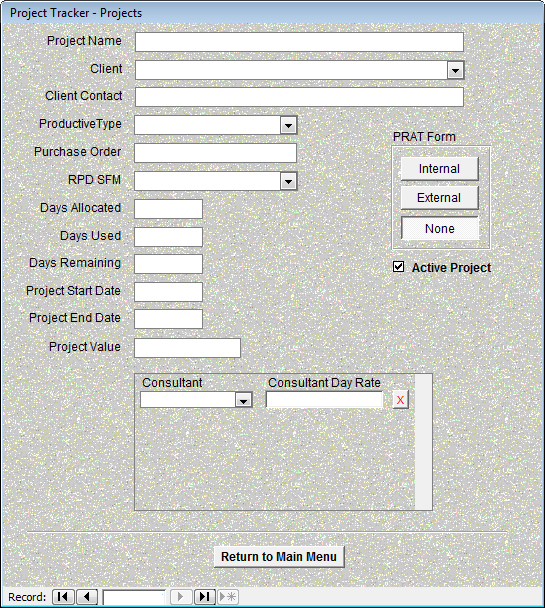 I normally create a form that acts as a menu to the various reports available. When the user selects a report I display it on screen, or if you prefer I can send it directly to your printer, most users like to see their reports on screen first to ensure the data the report contains is what they were looking for. Here the user can select multiple criteria in order to be presented with a report that exactly matches their needs. This also has an option to produce the report in one of three ways, to the screen, to a file, or directly to a printer. Some of the data has been removed from this report for display here. 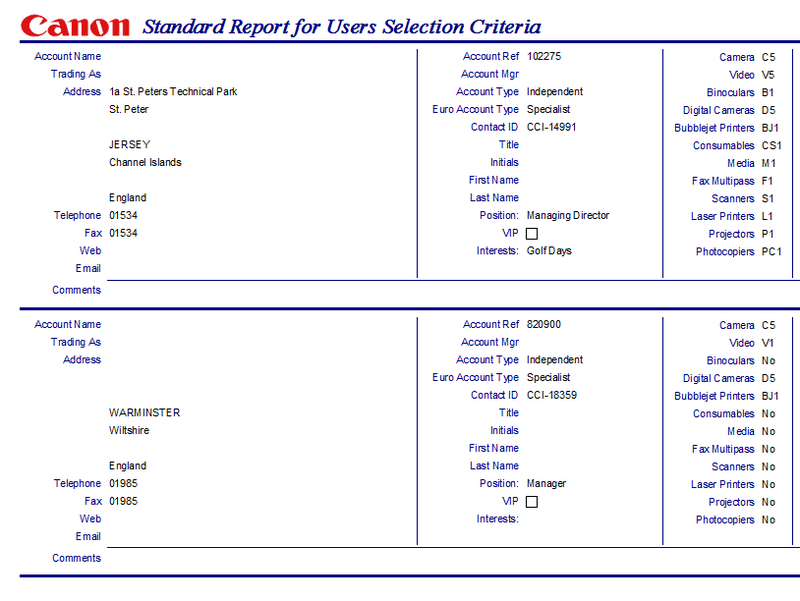 I can brand your system with your company colours and logo as can be seen in the report examples above, and in the form below. 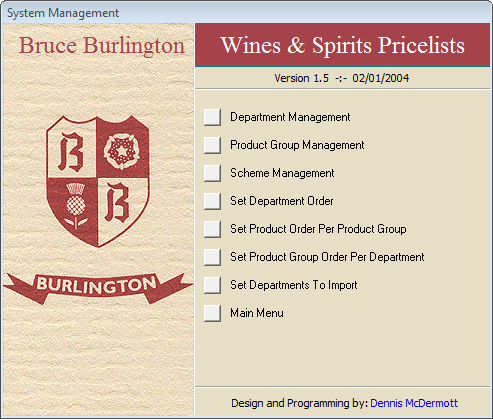 As mentioned above under 'Customised menu System' you will not see the standard Access Menus. The things mentioned above are for programmers to deal with, not end users. I always endeavour to create systems that are easy to use, are not confusing and are fast.